RETRO TRANSPO-Southern California has long been a nurturer of dreams that, while widely anticipated, often are never quite achieved. One particularly strong fantasy involves Los Angeles abandoning what one enthusiast calls its “car habit” and converting into an ever-denser, transit-oriented region. An analysis of transit ridership, however, shows that the region is essentially no better off than when the modern period of transit funding began in 1980, with the passage of Proposition A, which authorized a half-cent sales tax for transit. In 1980, approximately 5.9 percent of workers in the metropolitan area (Los Angeles and Orange counties) used transit for their commute. The latest data, for 2013, indicates the ridership figure has fallen to 5.8 percent. Instead of rushing to rail, Angelenos continue to rely on their cars to get to work. From 1980-2013, the market share of drive-alone commuters has risen from 70 percent to 74.1 percent. There has been an increase in driving alone of approximately 1.4 million daily commuters. Driving alone accounted for d approximately 85 percent of the region’s increase in commuters. Why do people stick to their cars? For one thing, transit takes longer. The average drive-alone, one-way commute in Los Angeles was 27.0 minutes in 2013, compared with an average commute of 48.7 minutes for transit. The other big factor is accessibility to jobs. The University of Minnesota Accessibility Observatory produced an estimate for the percentage of jobs that the average L.A. resident could reach within 30 minutes by car. In Los Angeles, the average resident can reach 60 times as many jobs in that time by car as by transit. Transit needs downtowns-Transit plays an important role in America, but mostly in the urban cores of a handful of “legacy” cities. These core metros (excluding their often-sprawling, low-density suburbs) – New York City, Boston, Chicago, Philadelphia, Washington and San Francisco – account for 55 percent of all transit-work trip destinations, just 6 percent of the country’s employment. Overall, the legacy cities’ transit ridership is nearly 10 times their proportionate combined share of jobs. To a large extent, this reflects history and urban form. Transit remains largely a matter of downtowns. The cities with transit legacies have an average of 15 percent of their jobs downtown, three times the average for other major metropolitan areas. In contrast, Downtown Los Angeles has 2 percent of the metropolitan area’s jobs. In Orange County, Riverside and San Bernardino counties, homes to much of the regional population, there are really no substantial downtown areas. In contrast, the many regions sharing LA’s multipolar form and large-scale transit investments – Atlanta, Dallas-Fort Worth, Denver, Minneapolis-St. Paul and Portland, Ore., – have seen their transit market shares stagnate or decline, despite having built expensive rail systems. One problem is, like virtually all U.S. metropolitan areas (including the suburbs of legacy cities), the Los Angeles area, which pioneered the multi-polar metropolis, has been becoming more so and is even moving beyond polycentricity. The vast majority of growth in the statistical area encompassing Los Angeles, Orange, Riverside, San Bernardino and Ventura counties has taken place in precisely those areas – the Inland Empire, South Orange County or the Santa Clarita and Antelope valleys in northern Los Angeles County – that also have the lowest transit ridership. In contrast, the core’s growth barely represents a blip. From 2000-10, the functional urban core, which has the strongest concentration of transit destinations, accounted for virtually none of the region's growth. Dreaming of New York? For many LA planners and urban boosters, more transit – funded from Washington – often seems to constitute an exercise of social engineering on a grand scale. The hope is that, by pushing transit, particularly rail, we will recreate the metropolis with ever-greater density. “We are going to remake what the city looks like,” then-Mayor Antonio Villaraigosa told an approving New York Times two years ago. Despite the hoopla and the subsidization of downtown Los Angeles, however, relatively few people work in, or even visit Downtown, except for sporting or cultural events, although many pass by it on the freeways. For most Angelenos, Downtown is simply not part of their day-to-day experience the way, for example, Manhattan is for many New Yorkers, or the Loop is for many residents of the Chicago region. Transit Class Warfare-Developers and their planning allies tend to focus on transit as something that will get middle-class Angelenos out of their cars. But it’s difficult to see this working as long as such an overwhelming majority of jobs (98 percent) are located outside Downtown. Since 1980, driving alone, which was increasing its market share, added 15 times as many new commuters as transit, with its slipping market share. At the same time, there seems to be a profound unawareness of the low incomes of Los Angeles transit commuters. The latest American Community Survey data (2013) indicates that the median earnings of transit commuters at the national level is more than 85 percent higher than in Los Angeles. In the metropolitan areas around transit legacy cities, the median incomes of transit commuters is 150 percent higher than in Los Angeles. To some extent, poorer Angelenos, in the government’s expensive shift from buses to trains, are being sacrificed to satisfy the Utopian vision of planners, pad the profits of big urban developers, and to build the campaign war chests of the political class. Indeed, from 2008-12, the bus lines, which carry more than three times as many passengers as trains, were cut 16 percent If LA is experiencing a transit revolution, its most dependent riders have been largely left behind. So What Should Greater LA do? 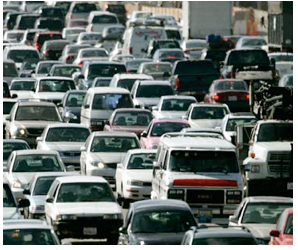 As anyone who drives the freeways knows well, LA has a traffic problem. But Los Angeles also has the shortest average commute time of any high-income world megacity for which data is available, despite having the highest automobile usage, the least transit and, except for New York, the lowest urban density. The real question is, will more transit, at least in its current form, offer the solution? Certainly, expanding and improving roads – although politically incorrect – has helped make commuting easier for many working in Orange County. Other ways to entice people off the roads, such as telecommuting, should be encouraged. Since 1980, the number of Los Angeles residents working at home has increased by approximately 240,000. This increase – 2.5 times that of transit in total numbers – has come at virtually no cost to taxpayers. To be sure, many Angelenos, for one reason or another, need decent transit services. Our approach would be for government to find out who these people are, and look for ways to make transit work better for them. Rather than invest huge dollars in rail megaprojects, perhaps we could reduce bus fares, a strategy attributed to the legendary Los Angeles County Supervisor Kenneth Hahn that increased bus ridership dramatically from 1982-85. Unlike today’s “progressives,” Hahn’s prime interest was serving his largely working-class and poor constituents. Besides cutting bus fares and increasingly service, other solutions, such as more competitively contracted service provided by regional agencies, such as Foothill Transit and the Antelope Valley Transit Authority, could provide less-expensive, more efficient and expanded service. Los Angeles Mayor Eric Garcetti, has also expressed interest in promoting the use of rideshare services, like Uber or Lyft, and, more importantly, self-driving cars. Ultimately, rather than try to recreate New York, or undertake the expensive and virtually impossible task of rebuilding Los Angeles in the image of the latest urban planning fad, we should explore a host of innovative solutions that will help transit riders here and now by developing workable, and effective, ways to help them get to the services and jobs they need.